The picturesque fishing village of Sougia is located in 67 km from Hania. It is built on the grounds of the ancient town of Suia. Modern Sougia attracts many tourists, mainly because of its remarkable, thin- pebbled beach and the surrounding green slopes with the pine-trees. The 150 inhabitants are occupied with tourism and fishing, as within a small distance, in the west, there is a well-protected natural cove. One should visit the ruins of the Roman Period and the basilica which was excavated by A. Orlando. At a small distance lies the ancient city of Lissos, where the famous Asclipieum stood, upon the ruins of which the church of Agios Kiricus was built. Online Travel guide with the best accommodation in Sougia. Find the cheapest hotels is Sougia & get exclusive online deals. Great rooms at bargain prices. Book online now! Compare Hotel Prices and read Reviews from others. Great Hotel rates and information See photos, reviews & what's nearby Sougia . 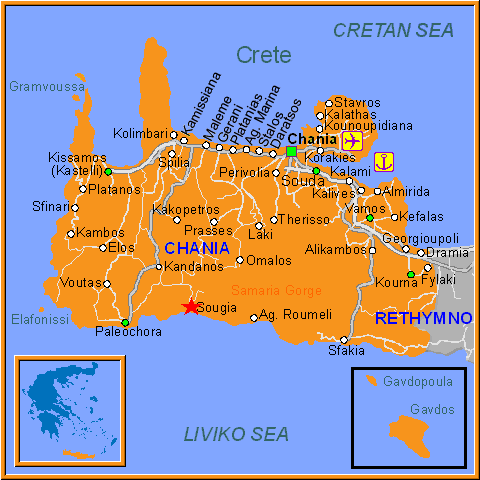 Detailed tourist and travel information about hotels of Sougia providing also regional information.